Pomegranate farming is growing rapidly in recent years. Pomegranate cultivation requires less water as this is a drought tolerant crop. Commercial production starts within 3 years in pomegranate plantation and lasts up to 30 years. This is a high-value crop and has export potential. 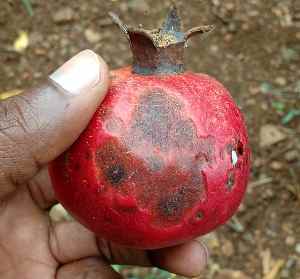 Here is the complete pomegranate farming guide in India. Known as a ‘drought tolerant’ crop, pomegranate or ‘anar fruit’ is native to Iran. Once they start fruiting they continue to give good yield for the next century and a half. Hence it is one of the most widely grown commercial fruits in India. Globally, India is the leading producer of pomegranates. In India, pomegranates are commercially cultivated in Maharashtra. They are planted on a smaller scale in states of Gujarat, Rajasthan, Karnataka, Andhra Pradesh, Tamil Nadu, Punjab, Haryana and Uttar Pradesh. Botanical family Punicaceae has two members of which the commercially grown pomegranate is of commercial importance. It is botanically called Punica granatum. It is deciduous shrub growing to a height of 6-10 meters. It has numerous spiny branches and narrow, oblong leaves. The flowers have between 3-7 petals and are bright red in color. Botanically, the red to purple colored fruits are called as berry since both seeds and pulp are produced from a single flower. The skin has 2 parts- the harder pericarp and an inner mesocarp. The mesocarp is spongy and the edible seeds or arils are attached to it. The seeds are juicy and their number can vary from 200 to 1400 in a single fruit. 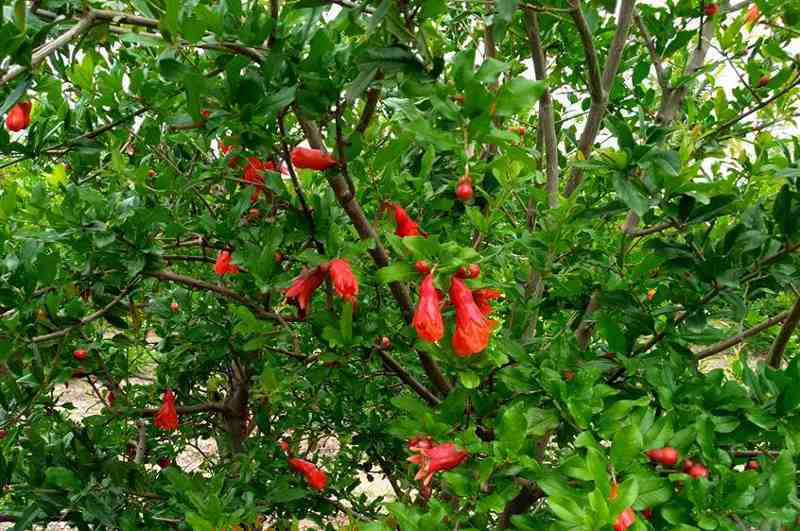 Pomegranate tree is deciduous in places where the temperature drops very low during winter. In sub-tropical areas, the tree is partially evergreen and evergreen in tropical areas. In general, pomegranates prefer dry climate for growth. It needs hot and dry climatic conditions during fruit development and ripening stages. It needs hot and dry weather in summer and cold and dry weather during winter. However, it cannot tolerate frost. It does not grow well in shades. Pomegranates are planted during February-March months (during spring) in sub-tropical regions. In tropical regions, pomegranate plantation is done during the months of July-August. Air layering is done usually during the rainy season and during November-December months. Although pomegranates can grow in a wide variety of soil, the best type of soil is deep, heavy loamy soils and soils having a good drainage capacity. It can tolerate alkalinity and salinity to a certain extent. Presence of moisture in soil causes fruit cracking and lower yield. In case of pomegranate watering is done taking into consideration the climate and plant requirements. In case they are planted as mrig-bahar, (plantation during mid-May, June-July) irrigation is done regularly till the monsoons set in. Irrigation must be done once in 2 weeks during winter and on weekly basis during summer. Drip irrigation is the most preferred method of irrigation since it helps save 44% water. The annual average water requirement through drip irrigation is 20 cm. On using sugarcane mulch, about 64% water is saved. In addition, the yield is increased by 30-35%. Developed in Pune by Dr. Cheema, the fruits of this variety have pinkish yellow to reddish yellow colored rind. The seeds are soft with pinkish, juicy flesh. It has a sweet taste and the tree is a heavy bearer. Each individual fruit weight is about 225-250 grams. 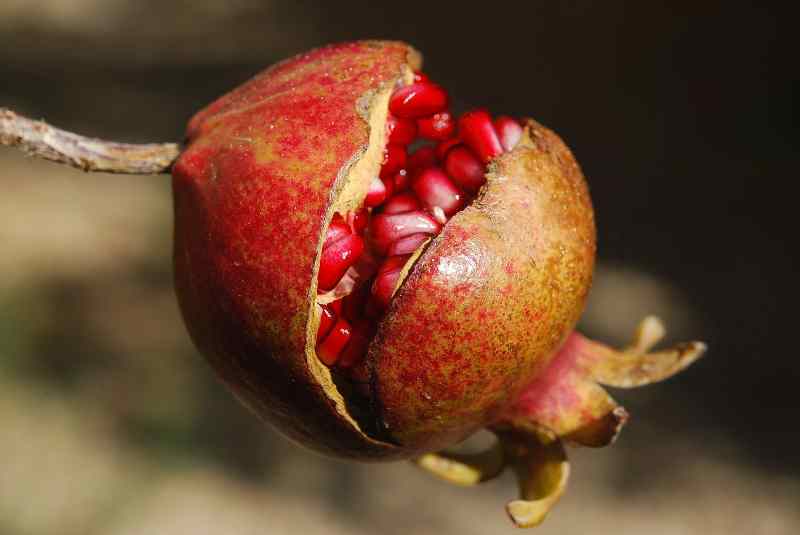 The skin of the pomegranates are red in color and weighs about 275 grams The grains are very soft and juicy. As the name suggests the fruits are dark red in color. The seeds are very soft. The fruits are red in color and have a glossy texture. The seeds are very soft. Bhagwa variety of pomegranate is very popular in European market for it’s size and color. Hence, this variety is popular choice for export. This is a popular variety grown in Gujarat. The fruits are large in size with greenish yellow rind. The seeds are soft, pinkish white with juicy acidic taste. ‘Bedana’ literally means seedless. The fruits produced are soft seeded and vary in size from medium to large. Spanish Ruby, Paper Shell, Muscat Red, Velladu are some of the names belonging to the seedless variety. Jodhpur local is a medium-sized fruit with a hard rind. The seeds are also hard, attached to light pink arils. They are juicy and sweet to taste. The land for pomegranate cultivation is prepared by ploughing thoroughly. It is ploughed repeatedly 3-4 times to break the soil clods, remove the debris and bring the sub-soil to the surface. Unwanted soil materials like rocks, stones, pebbles, etc. are removed. The soil is made into a smooth loose soil with fine texture. This step helps promote air circulation in the soil. Sometimes, organic matter (See, how to make organic manure) is mixed with the soil during ploughing. Once ploughing is completed the land is levelled and prepared for plantation. Pomegranates are propagated by air-layering or through planting the stem cuttings. In the temperate regions high density plantation is adopted wherein a plant distance of 5X5 m is maintained. Some farmers also maintain a distance of 2.5X4.5 m. High density plantation increased the yield by 2.5 times. However, very close spacing must be avoided as it increases the risk of infection spreading and disease development. There are two methods of planting followed in pomegranate cultivation, viz. square method and pit method. This is more commonly followed cultivation method. The inter-plant distance depends on the climate and soil type. In case of very light soils, a distance of 4-5 meters is maintained. Pits of dimensions 60X60X60 cm are dug a month before the actual cultivation. They are left open for solarization for a period of two weeks. To protect from termite invasion, the sides and the bottom of the pits are dusted with 5% carbaryl dust. After 2 weeks the pits are filled with topsoil mixed with farmyard manure and super phosphate. Once the pits are filled with soil they are watered so that the soil settles down. The air layers or cuttings are then planted and staked. The first irrigation is done immediately after this planting step. Pomegranates are trained on a single stem or in multi-stem. Single stem training has a disadvantage. They are more susceptible to infections like stem borer, shoot borer, etc. that would cause loss to the entire crop. Therefore, multi-stem training system is followed in India on a general basis. Ground suckers, dead or diseased branches and twigs, cross branches, etc. are pruned regularly. Pruning also gives tree the desired shape. It also encourages growth of new shoots. Since pomegranate plants are bushy and spreading in nature inter-crops are not grown. Some farmers however grow other plants since there is a distance of 5m between two plants. Low growing vegetables and pulses are grown in the intercropping system of pomegranates. In case fodder or rabi crops are being grown then there must be separate arrangements for irrigation. 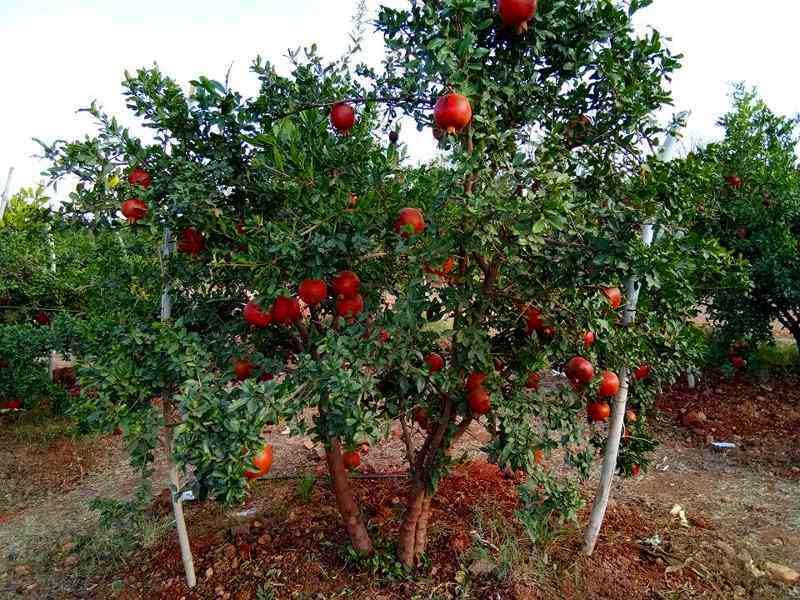 Generally high density cultivation is followed for pomegranate plantation. Hence, weeding must be done manually. It is done twice a year- once in May and second in December during the time of fertilization. Some farmers spray 0.6% of Gramoxone during the monsoon period. Spraying must be done by keeping the nozzle close to the weeds so as to avoid chemical drifting. Pomegranates bear three types of flowers, viz. male with rudimentary ovaries, hermaphrodite with medium style and hermaphrodite with a well-developed style. Flowering percentage varies between the varieties and time of plantation followed (bahar). They follow both self and cross pollination. Pollens are available during the noon time. The stigma is receptive for 2-3 days. Places wherein the monsoon is normal and regular, the mrig bahar pattern in followed wherein the plants flower during the monsoon months. January flowering is done only if there are assured irrigation facilities during the summer months of April and May. However on comparing the yields and prices, flowering in October is profitable. January flowering adds an extra expense on April irrigation. It is advisable to keep one fruit per place so that the fruits obtained are well-sized and rounded. Once sufficient fruits have set it, the remaining flowers are manually plucked to avoid further development of new fruits. Farmers keep a maximum of 100 fruits on a mature tree. This is most serious problem affecting pomegranate farming. They most commonly occur in fruits planted during the months of June-July and September-October. The fruits crack thus opening doors to fungal contamination making it unfit for consumption. The mrig bahar fruits (June- July) crack owing to variation in soil moisture and humidity cause cracks in fruits. Ambe bahar fruits planted during January to February months face prolonged drought conditions. This causes hardening of peel. When the rains arrive or once the irrigation is done the peels start cracking. For the hasta bahar crops, extremely low temperature during winter months cause fruit cracking. In order to prevent cracking irrigation must be provided to the crops at regular intervals. This would reduce fluctuation in soil moisture. Spraying 0.2% borax 30-40 days before fruit ripening also helps control cracking of fruits. Arils turn black in color or face discoloration. This commonly occurs in ripe pomegranates. Although no remedial measures have been suggested, it has been found that harvesting the fruits immediately upon ripening prevents aril breakdown. Pests like fruit borers, aphids, mealybugs, fruit sucking moths and white fly affect pomegranates. Spraying pesticides like deltamethrin, dimethoate, malathion, etc. have been found effective. Leaf spot and fruit rot are the main diseases affecting pomegranate crops. Spraying 2 grams per litre mancozeb during monsoon would take care of leaf spot. Application of 2 grams per litre Kavach during September and October months would prevent fruit rot. Pomegranates must be plucked when fully ripe. Letting the fruits stay on the trees for longer period of time can cause aril breakdown. They start bearing fruits 1-2 years after planting. But, commercial production can be started only after 2-3 years of planting. Harvesting the immature fruits would cause downgrade in the quality. Fruits are generally ready to be picked 120-130 days after fruiting sets in. On maturity, the calyx at the distal end closes. The sides also get suppressed and the fruits turn yellowish red in color. Pomegranate farming can be very profitable in dryland areas where plenty of sunlight is available. But, it has some bacteria and root diseases problems. You should continuously watch for symptoms. If you’re going for large scale pomegranate cultivation then it is advisable to consult professionals. Hello..can pomegranate grow in clay soil. If so what are the requirements for profitable pomegranate farming.